The machine is designed to debag frozen plasma from plastic donation bags, which are used in the CSL Bioplasma facility. The donation bags containing fresh frozen plasma will be fed into the machine where they will have a cut applied. The donation bag is then fed to a squeeze roller machine where the frozen plasma is extracted and separated from the bag. Utilizing a wash-down version of the Fanuc LR Mate 200iC 6-axis robot, the machine also has a self-cleaning routine incorporated into its functionality. The machine accepts loose ammunition cartridges and inspect them for damage via a high speed inspection system, utilizing Allied Vision cameras integrated with Teledyne DALSA's Sherlock vision software. 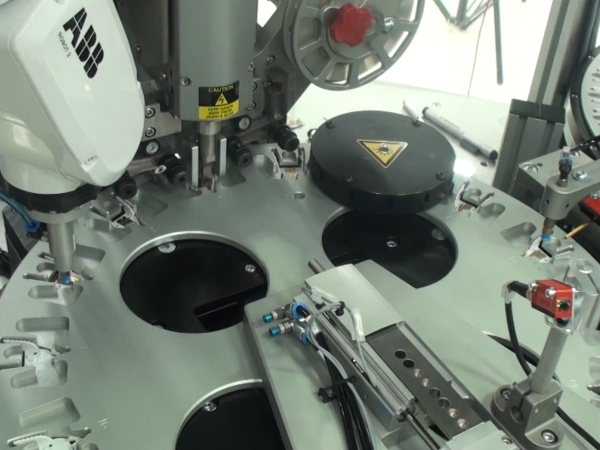 The machine was able to achieve the target inspection rate of 120 cartridges per minute. The inspection system also identifies a particular cartridge type to facilitate the sorting process at the back end of the machine. This line consists of 6 individual stations to assemble and test various electronic instrument clusters for an automobile platform. Each station is manned by a single operator who loads components and prompts their respective machine as required. 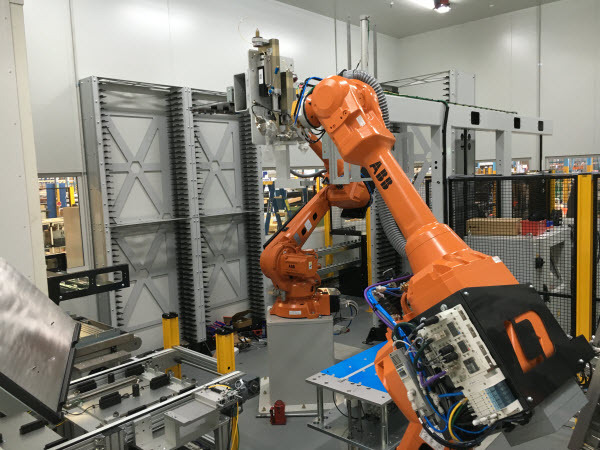 This bonding cell is in fact a very similar project to the FresCo project outlined above insofar as using robots to manipulate components and gluing them with a silicone dispensing system, curing the assemblies in a purpose-built oven and storing them in a buffer racking system. 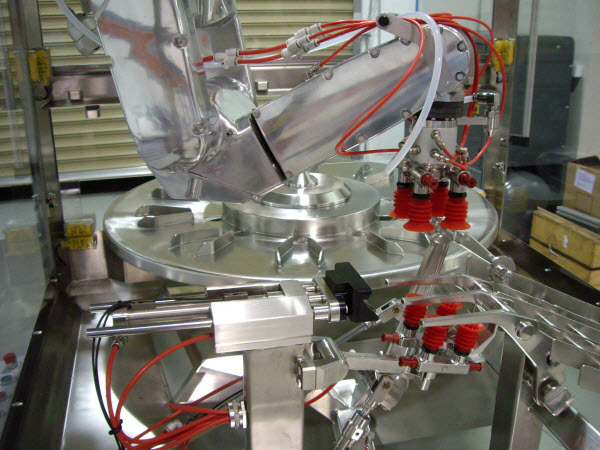 However, where the FresCo cell utilized 8 x ABB 6-axis robots to achieve the objectives, this cell only utilized 2 in a comparatively smaller footprint. 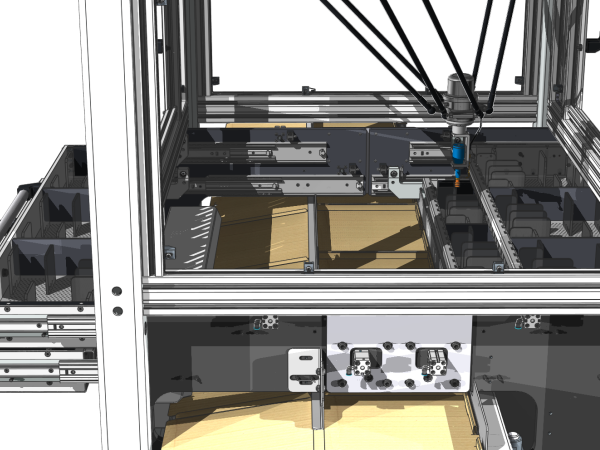 Leviathan Design rose up to the engineering challenge to meet production targets by very carefully using CAD software to precisely design multiple robot end-of-arm tooling (gripper), interchangeable with ATI tool changers, to suit all variants (where the FresCo cell had different robots for various functions). Leviathan Design is also open to collaborations with our peers on specific projects. 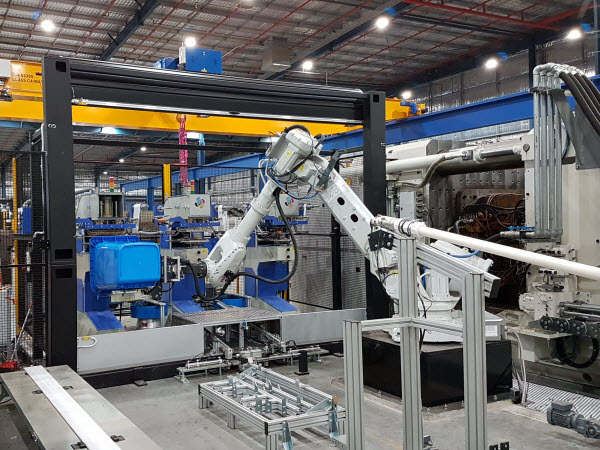 In this instance, Leviathan was contracted by Robotic Automation to partially design and build a robotic cell to handle different parts to create 2 separate timber products – vegetable crates and shipping frames. Leviathan Design was responsible for the design and manufacture of the timber feeding mechanisms and robot end-of-arm tooling (gripper) for the Motoman MH165 6-axis robot. Another collaboration with Robotic Automation in delivering an efficient system to the end-user customer. 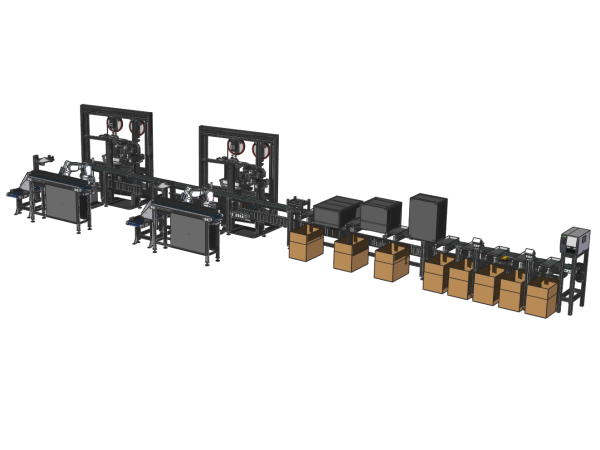 Leviathan was contracted to design and manufacture an automated cell utilizing a Motoman MPP3 4-axis high speed robot, with modular bays and dividers which allow various sized promotional posters and flyers at a cycle time of 2.5 seconds per pick. This machine is designed to apply a cut pressure sensitive adhesive film onto a lab-on-a-chip card. 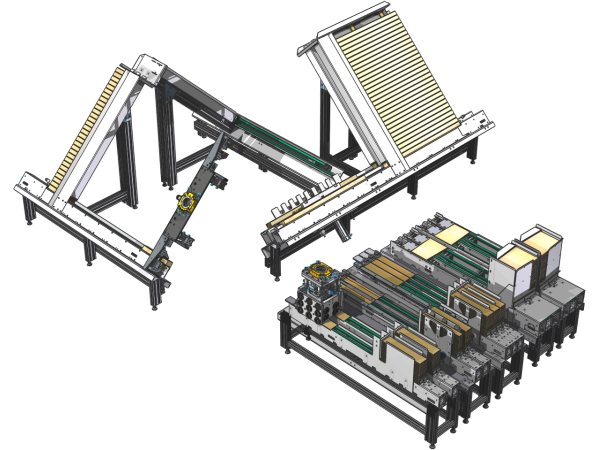 With a punch nest, rolling station, heat stamping station, and final electrical connectivity test station, all required to fit in a small footprint, the system is an extremely compact machine. Due to the space restrictions, Leviathan Design has employed a ceiling-mounted Epson RS4 SCARA robot with an integrated vision system, with which has achieved absolute success in the scope of required speed, accuracy, and clean-room compliance. 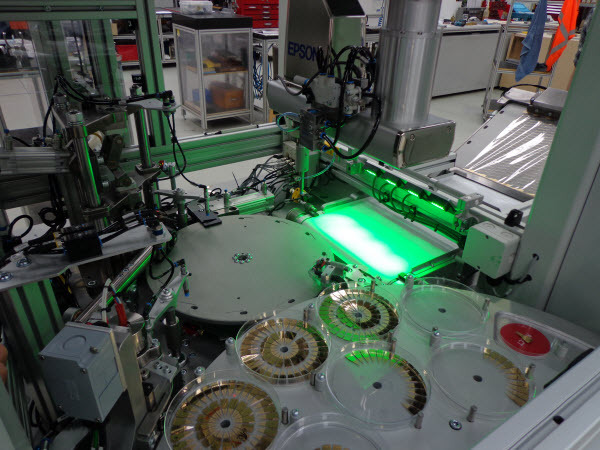 This machine is designed to assemble a Test Card, which consists of a lab-on-a-chip card, a capsule and a sheath. 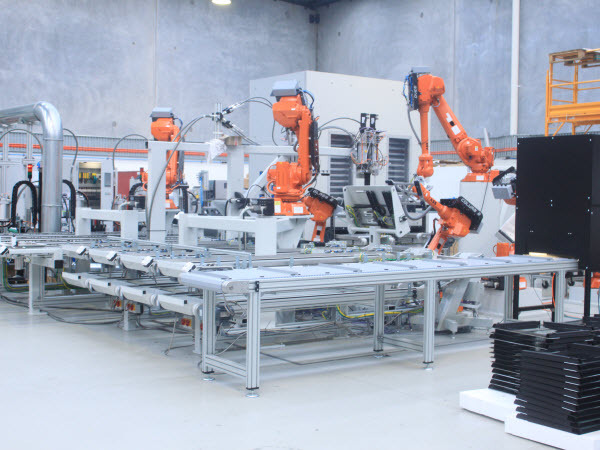 The fully automated system is capable of producing upwards of 1000 parts per hour. Through no small part of ingenuity from Leviathan Design engineers, with multiple iterations of design and trials, the end result is a successfully integrated compact system with a variety of functions, including 2 x ABB IRB120 clean-room 6-axis robots, ultrasonic welding, laser etching, bowl feeders, and Omron FH-series vision system and software for both robot integration and various product inspection. This line consists of 2 separate robotic cells (but exactly the same in function) working synchronously to process foam components. Each robotic cell employs 1 x Omron FH-series vision system integrated ABB IRB1200 6-axis robot to pick and place foam pads. 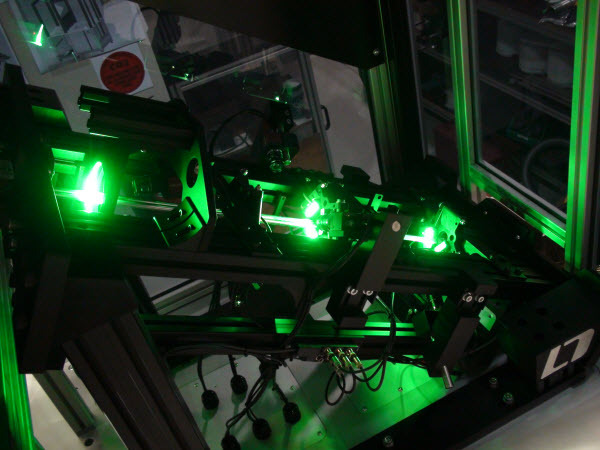 A complex array of pneumatic systems manipulate the product unto an inspection line, which houses a series of Omron FH-series vision systems to scrutinize the entire geometry of the product to ensure that they conform to the specified tolerances (as small as ±0.1mm and accuracy to 0.01mm). This collaboration with Bosch Australia Manufacturing Solutions is the latest endeavor of Leviathan Design. This cell utilizes 1 x ABB IRB6700 6-axis robot to remove wheelie bins (both 2-wheel and 4-wheel bins) and lids from an injection molding machine and manipulated for further processing: handle plug insertion, hot stamp imagery, sprue removal and stacking for transport. The cycle time of the cell is synchronized with the molding machine cycle time, down to 80 second per wheelie bin.